Hundreds of thousands of public sector workers did not go to work today - instead they took to the picket lines and the streets to voice their fears about Government plans to cut pensions. It is just the first shots in what is likely to be a long struggle for the future of the public services much of the British population takes for granted to the extent that some won't miss them until they are gone. I joined a rally in Huddersfield. My own union, Unison, was not striking and as someone working in the voluntary sector, the dispute does not affect my employment or conditions, but it does affect the community I live in and the services I and others use. 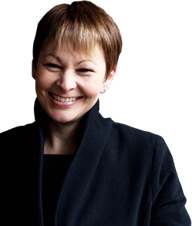 So showing support felt important, and it was good to know that not only Green Left and Green trade unionists were out around the country supporting the protests, but our party leader, Caroline Lucas, MP, joined picket lines in her Brighton constituency. "Fair pensions are worth fighting for," she declared yesterday. A striking contrast indeed to Ed Miliband, the Great White Hope of the tattered remnants of Labour Party progressives. After a leadership campaign last summer in which he portrayed himself as a slightly-more-sort-of-left-of-centre-type-of-guy, Ed has flounced and floundered and finally flunked at the prospect of today's strikes. Ignoring the dreadful lies emanating from the Government about the alleged unsustainability of public sector pensions (the Hutton Report shows that their cost will decline in real terms), Ed declared "These strikes are wrong." He tried of course to slag the Government off as well, saying it has repeatedly acted provocatively and recklessly (Ed's words). Yet he still expects the unions to engage in what is clearly a farcical process of meaningless talks with a Government which has already decided on the outcome. "This isn’t something I do lightly. I regret the disruption caused by industrial action and think it must only be used in special circumstances – and would urge trade unions to work hard to ensure support from the wider public. Yet when teachers are being expected to pay 50% more in pension contributions, work longer and get less pension when they retire – and when negotiations are failing – targeted and considered action is clearly necessary." Other prominent Greens also took part - with London Assembly members Darren Johnson and Jenny Jones (who is also London Mayoral candidate) joining the London march and hundreds of other party activists taking time to take part across the country. Now is the moment for trade union movement (which was fundamental to Ed Miliband's election as Labour leader) to seriously ask itself if it really wants to persist with the shell that is Labour. It is a tired out husk, a brand rather than a belief. The thinning ranks of those with genuine socialist beliefs remain completely sidelined, as we saw when John McDonnell was barred from standing for the leadership last year via a nomination process that would have Putin salivating. Miliband offers a "choice" (for want of a better word) of a different set of managers to the Con Dems, not a different set of values. The Green Party is a developing but in some respects still nascent force: it is better organised than ever before and has a wider range of values and policies than any of the other parties. What it still lacks in strategy, size and ideology it more than compensates for in its unity of purpose around social justice and environmental sustainability. And in leadership centred on conviction and values rather than soundbites, as we saw in the sharp contrast between the Labour and Green leaders during the last twenty four hours. In the coming months, while Labour struggles to find a narrative that makes any sense, Greens, already gradually rising in the national opinion polls and at the local elections in May, have an opportunity to make their voices clear in favour not only of protest action, but in setting out the values of equality, justice and sustainability that are at the heart of both the Green Party and trade union movement. They are also values held by most ordinary people in our country. With new action planned for October, Ed's moment may have passed; but perhaps the Green one is finally coming. Labels: "Caroline Lucas", "Ed Miliband", "Green Party", "industrial action", "J30 strikes", "New Labour", "trade unions"
Support the J30 strike. Today, across Britain. As Britain faces its biggest day of industrial action for many years, with around three quarters of a million public sector staff striking over cuts to their pensions, the mass media have unsurprisingly rallied to support the Government (and the treacherous Labour Party Opposition) in condemning the action and repeating the long used lie about "gold plated" pensions. 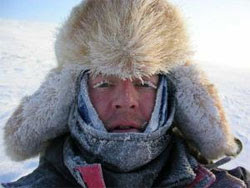 The Telegraph claims that a teacher on £32,000 p.a. will retire with a pot of this size; which if they have worked and paid into the scheme for 40 years is perhaps not surprising. But what the article doesn't clarify is that the £500k is the pot that they might have to pay their pension out off for the rest of their lives, not the actual pension they receive. On £32,000, the maximum permissible annual pension payable (not the pot it is paid from) is 1/2 the final salary, i.e., a somewhat less impressive £16,000 p.a., well below the UK average salary of around £23,200 p.a. (although the state pension will plug some of this gap). It is hardly "gold-plated", nor is it typical - the average yield from state pensions for retired teachers is around £10,000 and for all public sector workers is under £6,000 pa.
"This is 20 times higher than the average private sector scheme, according to figures from the Office for National Statistics." Daily Telegraph. The Telegraph frets that public sector workers are somehow treated unjustifiably well compared to private sector workers. 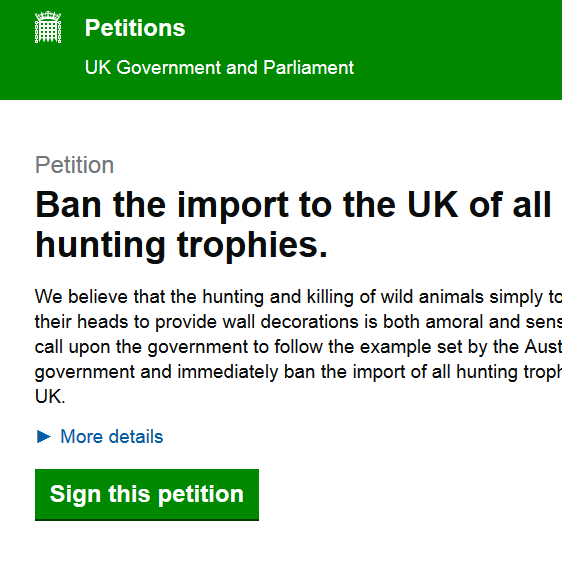 They don't stop to consider, perhaps, that if their figures were actually true and £6,000, or even £16,000 p.a. really is 20 times more than private sector pensions pay, then this is not a comment on bad practice in the public sector. Rather, it would be yet another example of how the private sector's owners comprehensively shaft their employees, pauperising them while guzzling plentifully out of the trough for themselves. Unfair comment? Not at all. The audit of public sector pensions shows them to be sustainable and actually to be set to decline as a cost in real terms over the next decades, contrary to Government assertions that they have become unaffordable. Moreover, as public sector workers are lectured (in the Telegraph again) by Treasury Secretary Danny Alexander (Lib Dem, Cairngorms National Park) on the need for austerity, it emerges unsurprisingly that private sector bosses have not just gold, but titanium armour-plated pensions awaiting them as they spin out their final days on God's golf courses. The "Morning Star", Britain's only genuinely left-wing national newspaper, reports an Income Data Services survey that shows the Directors of the top private companies in the UK enjoy pensions averaging £140,000 per annum - that's their pensions, not their pots. These people are raking in something of the order of seven times the supposedly fat-cat teacher, and a massive 24 times the average public sector pensioner. 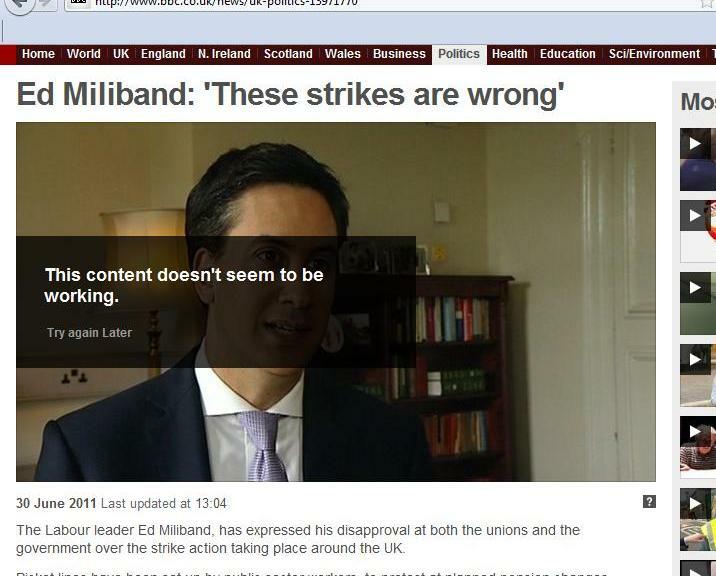 So there we have it - Tory paper tells fibs about strikers. Not news at all, but yet another piece of propaganda to try to steamroller through the destruction of our public services by a process of divide and rule. But the risk for the Telegraph and its allies is that while they may try to cleverly misconstrue what the real picture is via misleading comparisons (something the Star is also a tad guilty of at one point in its article), the anger of the mass public with the people who run our society, its workplaces and media is rising. Just as this week in Greece, protests turned violent, so the days of impunity on the part of the established order in the UK may be drawing to a close. Today (June 30th), join the protests, join the strikers around the country - show your support for fair pay for pensioners and for the beleaguered public sector. Join the Green Party leader, Caroline Lucas, MP, on the picket lines or in marches and rallies, even if you don't work in the sector. Its fate concerns us all - the public services are about all of us, our communities and well-being. 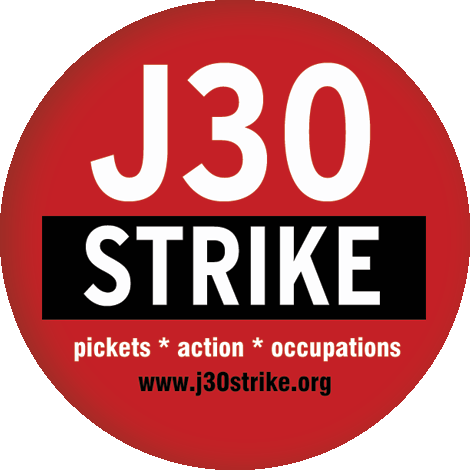 Don't listen to the lies - JOIN THE J30 TODAY! It must have been one of the most inspiring sights of the year. Spread across the walls of the Acropolis, high above the Athenian plain which birthed the very ideal of democracy, Hellenic Communists demonstrated against the austerity package being forced through the Greek Parliament by pseudo-socialist PASOK at the behest of the European Central Bank and the International Monetary Fund. With Greeks facing a further round of massive cuts in public spending - some €28 billions (£25 billions) in a country of just over 11,000,000 people - a general strike has begun and the streets of the capital have been filled for weeks with people from all walks of life protesting. The cuts come on top of a range of measures increasing taxes, cutting pensions and hiking the retirement age by 4 years, introduced last year in return for loans from the EU. With their nation staring bankruptcy in the face, demonstrations have turned to riots, with police deploying tear gas and a range of violent tactics to suppress the anger of the hundreds of thousands crowding in the city. 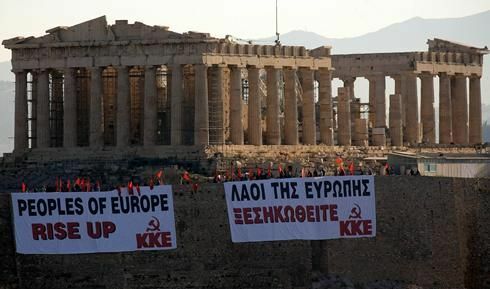 And on the Acropolis, the Communists unfurled their protest. It was a dramatic scene, one played out with a message in English as well as Greek to speak to all the people of the European Continent as smaller states like Ireland and Portugal face the consequences of Austerity Diktats imposed by the Central Bank and the financiers. And who suffers from these measures, the consequences even now a wave rippling out of the whirlpool generated by the credit crisis and banking collapse of 2008? Not the bankers or bosses, whose wealth is now at greater than pre-crisis levels. Not at all. The hit is to be taken by the public services, the hospitals, schools, transport and social services that support the least well-off but often hardest working in society. The Hellenic crisis is significantly enhanced by the neoliberal monetarist "shock doctrine" of orthodox economists who have run the IMF for decades and also prowl the corridors of the ECB. Their nostrums are about balancing books rather than investing in sustainable growth/equitable distribution of wealth, and consequently shrink economies further and further by sucking demand out of them. That these are also the underpinning of the single European currency, the Euro, adds substantially to the pressures on Greece. Indeed, it does not take a lot of examining to see that the real objective is far more about rescuing the Euro as a viable currency than about reforming or restoring the Greek economy. If Greece still had its own currency, we would not be here. There might still be problems with a large deficit, but these could be resolved by the Greek Government, free to take its own path and decide on, for example, expanding demand by printing money and generating wealth which in turn could increase the tax take and reduce the deficit. It could also devalue its currency in relation to other countries, improving its balance of trade and again improving Government revenues. In the Euro, with its fate tied to the desires of the Central Bank and larger economies like France and Germany, Greece has no such option. By contrast, Iceland, which continues to enjoy financial sovereignty and control over its own currency, recently voted in a national referendum to default on billions of pounds of debts. Has it gone bust? No. Iceland remains at work, its economy readjusting itself, albeit with some short-term disruption, but still functioning and with economic growth now returned. The same situation applies to Britain, which kept out of the Euro thanks to the punitive "five tests" created in 1997 by then-Chancellor Gordon Brown to deflect the starry-eyed desires of Premier Blair to join the super-currency. This far-sighted act has left Britain with control over its own currency and money supply. While, of course, we need to exercise prudence and cannot exist in isolation of the world economy, we retain the ability to increase the amount of money in the economy via the inelegantly named process of quantitative easing. Consequently, in spite of the hysterical nonsense prattled by the Con Dem Government, there is utterly no prospect of the UK going bust. Cameron and Clegg's often-voiced fears that the UK could end up like Greece are not merely inaccurate - they are downright lies. It is purely for reasons of ideology, not necessity, that they have worked so hard to impose the same neoliberal economic prescription of cuts and deflation on the UK economy as the IMF wants for Greece. And so this week Britain too faces strikes, with somewhere approaching three quarters of a million public sector workers likely to strike for one day in protest at Government plans to cut their pensions. Again the Government have trotted out a load of exaggerations about the pension schemes being unviable. Rubbish has spewed from Ministers' greasy lips about "gold-plated pensions" for public employees, when the average pension is in fact no more than around £6,000 p.a. But, like PASOK in Athens, the Con Dems parrot the line of austerity and cuts for the less well-off while the super-rich continue to flourish to ever greater heights of prosperity. The Communist demonstration on the Acropolis was not merely an imposing and inspiring sight. It was also symbolic in its location on the steps of the Parthenon temple, the House of the Hellenic Goddess Athena, deity of civilisation, workers and justice, and patron of the city where the concept of democracy was first fashioned into practice. On the same site where Socrates challenged the greed of the wealthiest and where Plato warned of eternal war between rich and poor, the battle is being fought for Europe's future - for a social Europe that values its people or for one based on the interests of secretive multinationals and a banking system that feeds on itself. We must pray that the Goddess is listening. And then join the protests on Thursday. RT's Alyona Show covers the infantilisation of the mass media - where scuffles outside a courtroom get infinitely more coverage than the uncomfortably important news items that really shape the world we are in. RT has its own agenda and own bias, but this piece does give a good counter-balance to the mindless mainstream news agenda. There is an oft repeated assumption, not only among the neoliberal right, but among many in the centre and Nu-labour infected centre-left, that two legs good, four legs bad. Or should I say "public sector waste, private sector efficient."? The theory goes that, if maximising profit from your activities is your main focus and sole objective, you will find ways to become ever more "efficient" and "effective". At what precisely? In the final analysis, at extracting as much excess cash from your customers as possible over the actual cost of producing the service or goods you are selling. It's not exactly a particularly edifying or trustworthy nostrum, nor does it in fact follow that you will provide the best conceivable service - rather you will provide the one that gives you the best financial advantage. The Tories' willingness to embrace this goes without saying. But why have even many of those who supposedly believe in public service been seduced into turning to the private sector to find ways to improve services to taxpayers? Whether in the form of the huge contracting companies like PWC and Crapita, which have ripped hundreds of billions of pounds from the public sector in return for poorer services (including abandoning one contracted-out Education Authority mid-contract); or in the form of consultants charging massive fees to identify savings; or whether in the form of the new owners of privatised state industries requiring ongoing government subsidies to carry out their role, as in the case of the nuclear power industry, private enterprise has in fact very little to recommend it as a guru of efficiency. Somehow, however, private effectiveness is taken as fact, in spite of the very substantial lack of evidence. British-owned private companies on average take far more out of their profits as shareholder/owner dividends than almost any other major economy - fifty per cent more on average than US companies and nearly three times the rate of Japanese firms. meaning that other countries regularly re-invest more and consequently outperform us. In spite of poor business performance, British Boardroom salaries have rocketed to phenomenal amounts, with bonuses proliferating far beyond the banking sector alone, just as ordinary workers have been told to tighten their belts. Greed is good, it seems, if you've already supped greedily enough. The railway industry is a case in point. By the end of the second world war, the private rail companies that ran the British rail system were more or less bankrupt, with tens of millions of pounds in accumulated debts. In 1946, the Labour Government nationalised them and turned them into British Rail, but, critically, made this new state company liable for the ongoing debts of its private predecessors. Consequently, although BR ran at an operating profit from 1947 to 1962, its requirement to pay the debts of the old owners meant it ended up making losses which had to be subsidised by the Government. After a while, with investment in new rail held back because of this, BR ended up requiring constant, ongoing public subsidies. In spite of this, an integrated, modern, electric rail network was created. 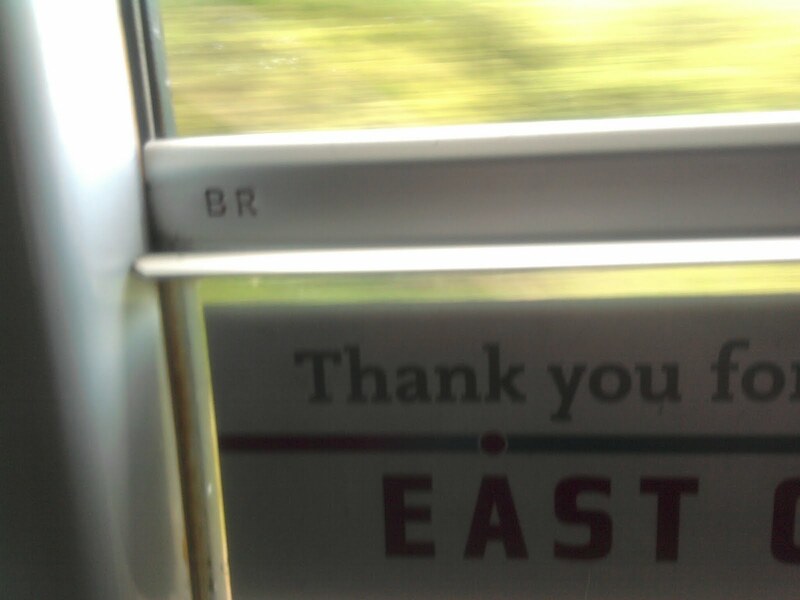 By the 1980s, a steady decline in passengers had reversed and massive investment began in the Channel Tunnel project, which was completed just before BR was split into 24 regional and network franchises and sold off to the private sector in 1994. The Conservative Government claimed that by doing this, the magic wands of the profit-seekers would drive forward ever-better rail services and cut costs, so that the taxpayer would no longer be out of pocket (albeit because of the original losses of the private sector way back in the 1940s). But nothing could be further from the truth - rail services are no more efficient that before privatisation. Customer satisfaction has declined although transport requirements mean more people have to use the service. Our fares are among the highest in Europe. And the public subsidy at today's prices has risen from £2.3 billions in the last year of BR to £5.2 billions in 2008/9 - an increase of 126%. This has been cut in the current financial year, but will still stand at nearly 110% more than the cost of BR to the public purse. So, with the Tories eying up more private involvement in the NHS even after the revision of the health bill, as well as seeking to widen private contracts in government as some sort of panacea for every problem, the Left need to reassert that it is not just on the basis of ethics and ideology that we want to see the state running our public services; it is also because keeping things in the public sector makes plain good business sense. London to Wakefield service last week: nearly 20 years and £48 billions in taxpayer-funded subsidies after privatisation, East Coast railways and their rivals are still using decades old British Rail rolling stock. I recently purchased a new anti-virus package. It has some faults, but recently, when I did a Google search for David Cameron, my anti-virus package linked with Google to provide a very salient set of warnings. Sometimes we worry the Internet is being used by Big Brother to watch what we are doing. But could this be one time when the Net fought back against the Orwellian nightmare engulfing us to provide citizens with a first line of defence? At least Adolf Hitler had some combat experience, even being decorated on the recommendation of his Jewish Company Kommandant. As he presides over the "war-in-Libya" but not "war-with-Libya", British Premier Dave Cameron, a man who has never served in a war but happily makes one, yesterday gave vent to his frustration with military commanders who have expressed concern that British forces are overstreteched between their commitments in Afghanistan, Germany and now Libya. "You do the fighting and I'll do the talking", he admonished them bravely via the living hell of a Downing Street press conference. His ire came as it was revealed that the Libyan adventure - very much his initiative back in February when he rushed round Europe lobbying for a euphemistically titled "no-fly-zone" - has. so far, cost over quarter of a billion pounds of UK taxpayers' money. Each £800,000 Tomahawk missile fired by UK forces at Gaddafi's forces on behalf of the shadowy rebel alliance is the equivalent of a full-equipped NHS hospital ward being lobbed into downtown Tripoli. Not a sum to be sniffed at, and our Dave has the guts to make clear that this must be seen through to the end. He's ready to have Our Boys get on with the shooting and killing (and being killed) around the globe if needs be. While he will chip in with his gaseous utterings to anyone unfortunate enough to have to listen. 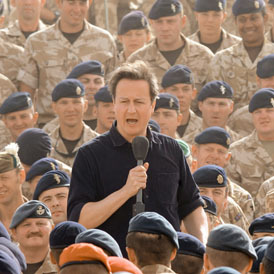 It is fortunate to be alive in Britain now: for 60 years we have been spared a major war. Unlike previous generations, slaughtered in the trenches or mowed down on the beaches of Normandy, relatively few of us have tasted real combat. And even fewer among our political class, most of whom have not even changed a light bulb let alone a bayonet during their graceful ascent from public school via Oxbridge to the Boardroom and Cabinet Office. It is a well-observed nostrum that in the annals of peacemaking many of the most fervent advocates of peace are former soldiers. Few who have been in a war will willingly entertain another one for any but the most necessary reasons. Notably, in the conflicts in the Gulf in 1991 and 2003, it was politicians rather than military who were the strongest advocates of war - "Stormin" Norman Schwarzkopf, the US commander in Desert Storm, argued that the military could and should wait for up to two years for UN sanctions to force Saddam out of Kuwait. But President Bush Snr wanted his glory, as did Junior a decade later, in spite of his own draft-dodging past. And let's not even think about Blair, who wouldn't know one end of a gun from another, but seemingly just loves the smell of gunpowder in the morning. Yet aren't they so tough, these proud men? 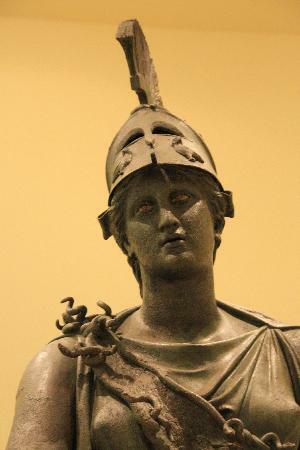 Like the later Roman Empire in its sharpest decline, where the bureaucracy and senatorial class adopted military uniforms but simultaneously banned themselves from army service, our politicians are full of other men and women's bravery, ready to take the toughest of decisions from the safety of their offices, the bloody consequences of their actions far out of sight and out of their timid minds. They are of course put in power and sustained by a massive military-industrial complex, as brilliantly covered by Simon Jenkins in a recent Guardian article here. This shows how, in spite of the removal of the Soviet Bloc and the comparatively fewer threats to national security in recent years, the West continues to spend more and more on weapons and, having acquired them, can't quite fight the urge to find somewhere, even anywhere, to use them. And with the rise of automatic weaponry like drone planes, the ease with which these can be deployed is increasing exponentially. We were warned, sixty years ago. By a politician, yes, but one with spades of military combat experience in the Second World War. 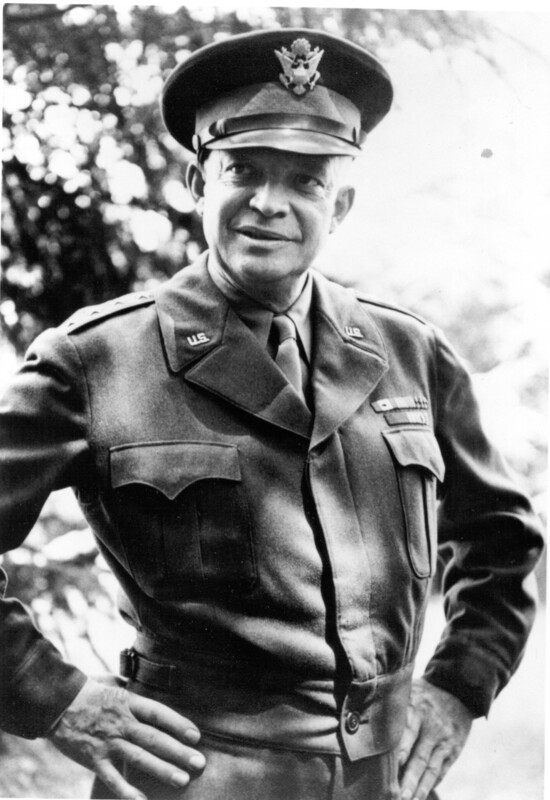 President Dwight Eisenhower spoke darkly of the rise of a military machine that, in time, would consume both the industrial and political classes, suborning them to the objective of war. As Dave Cameron contemplates his next brave speech, ducking the slings and arrows of verbiage hurled by his suited and sitted opponents across the floor of the Commons, he might do well to reflect, when he does the talking, on just how empty his own words really are. You couldn't make it up! 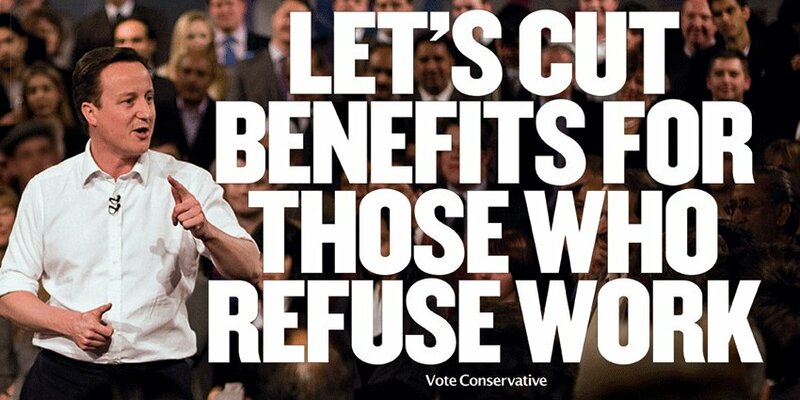 But trust (if you dare) Nick Clegg to do just that. Eying his party's rock bottom poll share, our unloved Deputy Prime Minister has come up with a wheeze he obviously thinks will curry favour with recession-hit voters. He wants the State to divest itself of the two fully owned state banks - Lloyds and RBS - by giving shares to every adult in the UK free of charge, which they can sell once they reach the price the State originally paid for them back in 2008/2009. This would be 50p per share in RBS and 73p in Lloyds and we would all get 1,450 and 450 shares in each bank respectively. BUT, the rub is that you could only sell the shares for the excess over the price paid by the State, so that the Government can recoup the cost of its original purchase of the banks. Nick's big giveaway works like this: if your RBS shares reach 60p each, you can sell them and you get exactly 10p per share (60p sales price less the original 50p which goes back to the State). So that would leave you with as much as £145 minus tax of £29 and sales commission of maybe £8 leaves £108. It is always something I guess, but......at the moment, the shares are actually worth less than the State paid for them - 45p for RBS and 37p for Lloyds. So the Great Plan is to give the citizens of the UK approximately £15 billions of debt in these banks. 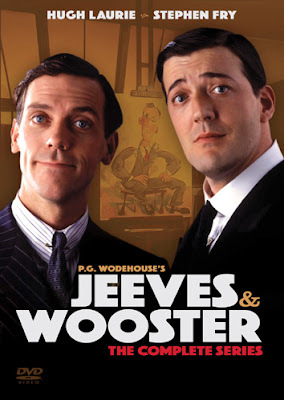 Not really an even vaguely attractive prospect, but somehow very apt for the hapless Deputy PM and, of course, his ever chippy sidekick Vince Cable, the eminence incapable of the Coalition. With the Lib Dems standing at just 1% of the vote in the latest poll for London Mayor (and outpolled by 13 to 1 by the Greens among 18 to 24 year olds), offering the public something that has absolutely no value at all seems to summarise their prospectus and prospects more eloquently than anything any of their opponents could possibly dream up. A pity though, that these soulless men, shorn of any tattered shred of Keynesian Liberal principle, should squander the golden opportunity they have to transform the banking sector from a focus of greed into a genuinely mutual or co-operative sector, funding sustainable recovery. The nationalised banks could have been precisely the right vehicles to create a network of community banks, supporting prudent investment in social enterprises and co-operatives, helping individuals and communities to restore their fortunes. Certainly that was the sort of approach the old Liberals argued for that back when the financial sector still had a large mutual segment in the form of the building societies. They opposed the Tories' sale of state-owned Girobank in 1989 (ultimately to be part of Santander) and an SDP peer, Lord Taylor of Gryffe, led the opposition to the theft of the Trustees Savings Bank from its depositors and its subsequent sale to the private sector (ironically ultimately to Lloyds) by the Thatcher Government. These days are clearly long gone. By contrast, the model proposed by Clegg is one first widely used in the former Soviet Union in the 1990s, where it was known as Voucher privatisation. There, state assets were stripped and given away to all citizens in the form of low value share vouchers (at the behest of the ever eager advisers sent out there by the Margaret Thatcher Foundation). The Russian mafia made a (financial) killing as desperate people sold their shares off cheap to grab a few roubles - much as many would do with the pittance offered by Thatcherite Nick's sale of the century in recessionary Britain. Desperate men employing desperate measures; but at a huge cost of missed opportunities and squandered assets which could have been employed so much better for the Common Wealth. An interesting article today in the New York Times on the Desertec North African solar project, which promises to harness the solar potential of the Sahara to provide Europe with guaranteed, clean, renewable energy. Under the DESERTEC proposal, concentrating solar power systems, photovoltaic systems and wind parks would be spread over the desert regions in Northern Africa like the Sahara and the Maghreb regions. Produced electricity would be transmitted to European and African countries by a super grid of high-voltage direct current cables. As much as 100 gigawatts could be produced and carried to the European mainland, around 15% of total energy requirements. Desertec, it is argued, would be enough to help Europe meet its target of 20% of its energy being from renewable sources by 2020, especially when combined with other renewable sources easily tapped by the Continent, including on and offshore windfarms, barrages and ground sourced heat. The North African component is a key part of this project. And for Greens it is a controversial one too. For while it offers to provide our Continent with clean energy, the political machinations surrounding it are substantial, and inevitably the Arab Spring poses many questions about how and whether this project should proceed. At its core is an assumption, a need even, for the north African regimes to be friendly to Europe. From Egypt to Morocco, with the notable exception of Libya, the ancien regimes of Arab nationalism have been co-opted to provide solar sites and transmission for Europe. Hence, in part at least, the reluctance to call on Mubarak to go when the Tahrir Square demonstrations began, and the continuing support for some pretty reactionary and brutal governments, especially in Algeria. 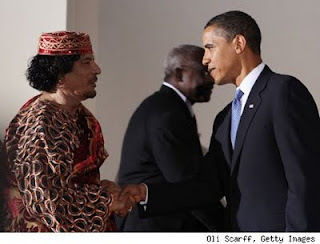 It may also partly explain why the West is keen to see a new regime in Libya. Gadaffi, like his nemesis King Abdullah of Saudi Arabia, has been no proponent of renewable energy. Libya has enjoyed a massive income from oil and while the solar project would doubtless convert sunlight into euros (or maybe preferably dollars), oil for now remains more profitable - indeed, tightening supplies in the years ahead promise ever higher dividends for the oil men. 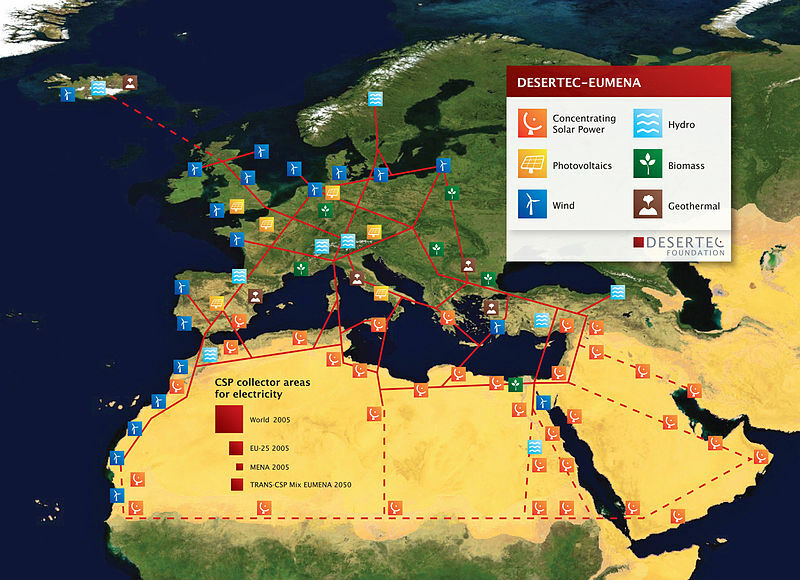 Consequently, Libya has declared itself officially not interested in Desertec and it has not been part of the project in spite of both its potential as a site for solar farms and its geographical centrality to the proposed solar network. Will a new Libyan regime, already in debt to Europe for its war funding, take a more emollient view of the renewable project? Some have questioned the viability of the scheme, and many Greens have argued that it is simply not needed - smaller, more local or regional projects harnessing community and individual resources would, if fostered properly, produce enough for our needs. But the corporations that own and control our energy supplies think very differently - they want massive projects like Desertec so that their monopoly/oligopoly of energy supply will continue even beyond the age of oil. The Desertec organisation, a combination of no less than a dozen privately owned European energy companies, is no exception in spite of its green tinge - although set up as a not-for-profit foundation, its funders and partners, are private companies, making it in essence a "front company" for what is a large, profit seeking conglomerate. By contrast, microgeneration projects, where communities and even individuals can use assets such as their homes to become producers as well as consumers of energy, threaten and actively undermine the grip of large corporate suppliers. This could well be one reason why the UK Government has effectively destroyed any prospect of significant community microgeneration by announcing the end of funding for most small scale projects. So it is not just oil that drives energy wars and not just oil that multinational corporations seek to turn into saleable assets. Energy is key to a vast range of human activities, especially those regarded (albeit often rather questionably) as "civilised". As we stand on the threshold of a new age of clean, renewable energy, while we should not automatically turn our backs on large projects like the solar network, let's hope we can at least find politicians with the will to challenge energy companies that seek to prolong their stranglehold on the supply of such a vital resource, whether from fossil or renewable sources. If we end up turning sunlight into a corporate commodity, what is next? 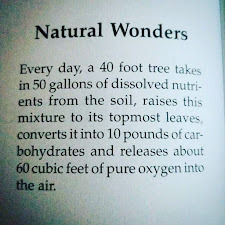 Is only air sacred, or is that a dangerous question not to be asked? Obama Covers Up Nebraska Nuclear Accident? A fire has broken out in a nuclear facility in Nebraska. It may not be of the proportions of Fukushima, but there again, as the President of the United States has reportedly ordered a blackout of all news from the plant, we can only hope that is the case. After all, it took the Japanese Government several weeks to admit to the disastrous levels of radiation that even now continue to leak out of their damaged reactors to spread over almost the entire surface of the Earth. The fire, which broke out after the nearby Missouri river burst its bank a fortnight ago, has knocked out a cooling pool for spent fuel rods. As to how bad it is, there is no news other than that "an unusual event" has been notified to the authorities. Reassured? No, not likely. We have been here before so many times with the nuclear industry - firstly we are told the plants are so safe that nothing can go wrong; then, when something goes wrong, they assure us that its nothing to worry about; and then as it gets worse, they tell us that the particular reactor or plant is an old one and the problem could not repeat itself anywhere else. Except that it does - Fukushima was frowned upon by the world as a uniquely stupid place to site a nuclear power plant. After all, it was by the sea in an earthquake zone. So, unlikely to find similar situations elsewhere. Well, the Nebraska plant is next to a major river on a flood plain. Smart siting? In March, a Canadian reactor suffered a pump failure and has leached tens of thousands of gallons of radioactive waste into Lake Ontario. And even in Britain, plans are afoot to recommission a nuclear power plant on the north Wales coast in spite of two recent major (by UK standards) earthquake tremors and being right next to the sea. Why on earth do we keep buying into the nuclear lie? Supposedly cheap, it isn't - it has never been profitable so governments have had to pay electricity companies to build nuclear power, subsidise them to operate them and now shell out to decommission them. In the UK, decomissioning our existing, aging nuclear power stations will cost in excess of £73,600,000,000 over the next century, a figure substantially eclipsing the bank bailout with no prospect at all of any cash back. And then we have to keep the waste safe for several thousand years - laughable if it wasn't so execrable. Clean? No, it isn't. And safe, no. Who knows what is happening in Nebraska? If it is so safe, why has the operating company simply said that rumours of a level 4 nuclear alert "are not how we classify nuclear problems" and why has the President stepped in? This is the man who won an award for transparency - so what is so seriously wrong that he has imposed this ban? Of course, we may never know. Perhaps in 10 or 20 years cancer deaths in the state will be notably higher, or not. But the fact is that just as Chernobyl even now makes sheep on Welsh hillsides sick and inedible, Fukushima has shrouded the world in its toxic embrace. If Fort Calhoun threatens to do the same, the world deserves to know and know now. The Lib Dems technically "lost" the constituency of York at the last election - boundary changes made it notionally one of their seats, but when it came to it the Tories won by a significant margin. But that hasn't stopped them from aping the eponymous Duke of the same city in the famous children's song where he "marched them up to the top of the hill, then marched them down again." Again and again in recent months we have seen just how appallingly bad the Coalition Government is for lack of foresight and planning. Of note - the supposedly cost-cutting student fees increases which were meant to deliver savings, except that by bringing them in at the same time as allowing universities to charge up to £9,000 a year, the cost of upfront loans is now prohibitively expensive to the Government to the tune of no less than £1,000 million per year more than anticipated. Which the Muppet, and which the puppet? Linked to this was their pandering to rightwing myths about non-existent social security benefits by slashing the numbers of overseas students, a move which will mean several billions lost in both education fees and money coming into the UK from abroad. Not only does this ignore the benefits to Britain of potentially influential people from other countries being educated here at their own cost, but it will possibly bankrupt some universities and deny even costly educational opportunities to British students. Now this is being reversed in a desparate attempt to shore up the gap in funding from student loans. Then came the NHS debacle, which the Coalition's "partners" are fighting with each other over trying to claim which of them has "won" after their faux "listening exercise". And meanwhile the revised plans quietly remove the obligation on the state to provide universal healthcare to its citizens. And now this - in the middle of negotiations on public sector pensions with the trade unions, Chief Secretary of the Treasury, Danny Alexander, jumped the gun and boldly announced to a thinktank's conference that employees' contributions would rise by 3.2% of income and members would have to work an extra year. Again, the Con Dems have echoed and pandered to myths about "gold plated" public sector pensions, when in fact the average pension paid to a public sector pensioner was just £6,500 p.a. in 2009/10 They also ignored the fact that by increasing pension contributions, it would deter many from saving in the first place, leaving the state to pay more when they did finally retire but would be entirely dependent on state pensions and benefits. So, after an understandable outcry and threats of sustained strike action from the trade unions, what has happened now? Ooops! Danny has changed his mind and decided to go back to the table with the unions. On one level, good as it may mean some chance to stop some of this nonsense, and all power to the unions for being instrumental in achieving this. But this is not a listening Government, as it cravenly claims each time it backtracks on some insensitivity or botch up. 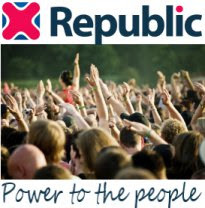 Rather, it is a disorganised, thoughtless and ideologically fundamentalist regime intent on rapidly "changing everything by 2015 " so deeply that it would take decades to reverse the increasingly market-orientated "reforms" introduced across the public sector at great cost to citizens' wellbeing and the public purse. Even if the public comprehensively rejects the ill-thought up "Big Society", the Coalition's rush is about ensuring that we will be stuck with it for decades to come, regardless of our wishes or the irreversible damage done to so many long established public services in the meantime. 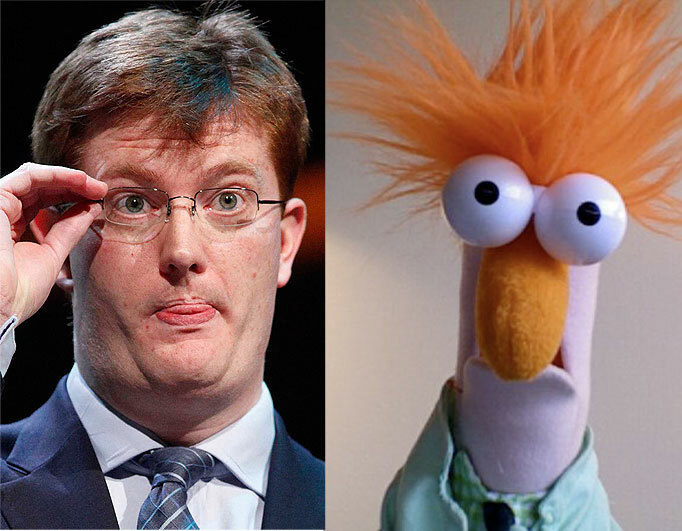 Danny's nick name is Beaker, owing to his striking resemblance to the carrot-topped Muppet of the same name. Clearly, in the comedy of errors that passes for the Coalition, the resemblance is increasingly more than physical. Poor chap, he must be exhausted by the constant U-turning, totally out of his depth as he spins for his ungrateful Puppet Masters, Cameron and Clegg. Appropriate indeed, then, is this performance of Coldplay's "Yellow ", a paean to anxious confusion and hesitant hurry, sung by none other than Beaker the Muppet himself. And of course, yellow is the jaundiced colour of the Lib Dems, in more than one sense. Yep, go Danny boy...How he must miss those days thinking up press releases on red squirrel conservation for the Cairngorms national park. It is filmed almost entirely in the dark, with little more than the occasional glimpse of light or shadowy figures, but this is possibly the most terrifying video you will ever see. A group of people taking refuge in a garage in Joplin, Missouri, weeping and screaming as a tornado hits - one of a record breaking 600 to strike the USA this year so far. And it is all totally real, authentic and frightening - there is no CGI; only Nature unleashed. As wilder and ever more dangerous weather events become the norm, this could be just a foretaste of the world of tomorrow, where climate change produces more and more extreme weather - like Britain's coldest winter in living memory last December followed by its driest and warmest Spring in history; or the once-in-a-century drought in China and the massive floods in Australia. This is the reality of what our species faces in its fight to survive on Planet Earth. We may party on and pretend it isn't happening, but outside the winds will blow and the rivers roar - and sooner or later, we may join the people of Joplin, cowering in the dark with prayer our only comfort. "The current level of atmospheric CO2 is higher than at any time in the past 15 million years. When CO2 was last that high, "global temperatures were 5 to 10 degrees Fahrenheit higher than they are today, the sea level was approximately 75 to 120 feet higher than today, there was no permanent sea ice cap in the Arctic, and [there was] very﻿ little ice on Antarctica and Greenland." We are doing this. Not the Sun. Not God. People. 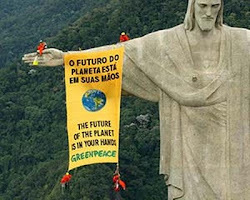 No, not another report by the IPCC or Greenpeace. And not the world that might come to mind. 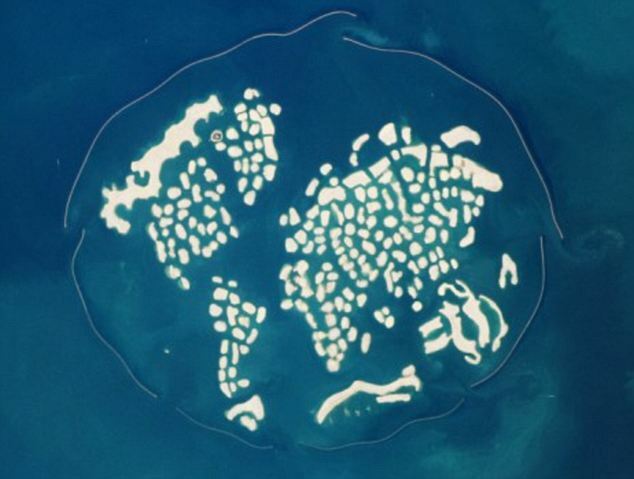 This World is the collection of man-made islands off the coast of Dubai, constructed out of the sea at huge financial and environmental cost. Each one supposedly represents a country and, separated only by narrow channels of water, together they look like a patchwork map of the planet. They have been marketed to a range of wealthy individuals, including footballers, film stars and businessmen, one a former boss of mine. It is more than faintly ironic that this hubristic enterprise is now reportedly sinking beneath the weight of its own pomposity. The "Daily Mail", not exactly the greenest newspaper in the UK, has run a series of articles on how the Gulf is gradually washing the artifice away and reclaiming the sand for the seabed. Other more reputable news media have reported similarly, so much that the consortium that runs the islands has published a denial this week. World of Water - the sinking planet? I am no civil engineer, but the photographic evidence doesn't look that good to me; though perhaps I may be wrong. Either way, this project represents the very worst of our species' excess: that we run our world via an economic system that leaves literally hundreds of millions of people homeless, while a tiny group of rich people are able to accumulate hundreds of millions to spend on creating a fictional planet on the sea, causing massive damage to the environment as they go. The Gulf states of course are the playgrounds of the western rich - one reason why our leaders are so silent on the violent repression of dissent in the likes of Bahrain. These princedoms were created by the British, sustained by the USA and are now in effect owned by the international financial elite. Boasting superstructures like the Emirate Towers, the highest hotel in the world (the highest six are all in Dubai), an indoor ski resort in the middle of the Arabian desert and a host of imported, penniless labourers and servants from southern Asia to make it all possible, the strip of land along the southern shores of the Gulf truly is the Babylon of today. It is little wonder that the United Arab Emirates, which Dubai is part of, boast the third highest carbon emissions per person on the planet - at over 31 tonnes, a massive 16 times the safe limit for the planet. Only the Antilles and nearby Qatar, both similar playgrounds of the wealthy, are higher. And this fest of excess shows no signs at all of slowing let alone stopping. 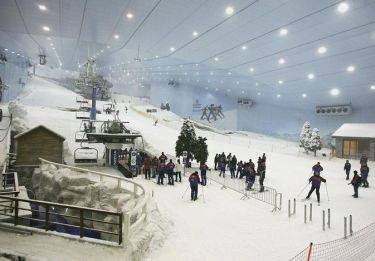 For many people of even relatively modest means, a holiday to Dubai is now an aspiration, a sign of having made it. 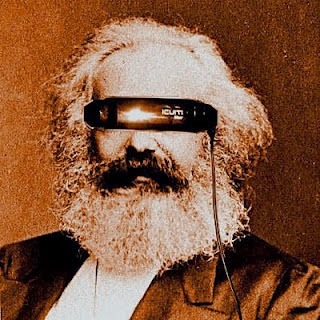 With many of the grasping corporations and greedy individuals who enjoy this life of extreme consumption merely encouraged to ever greater heights of auspicious display by both governments and our runaway economic system, there is little hope indeed that this will come to an end anytime soon. 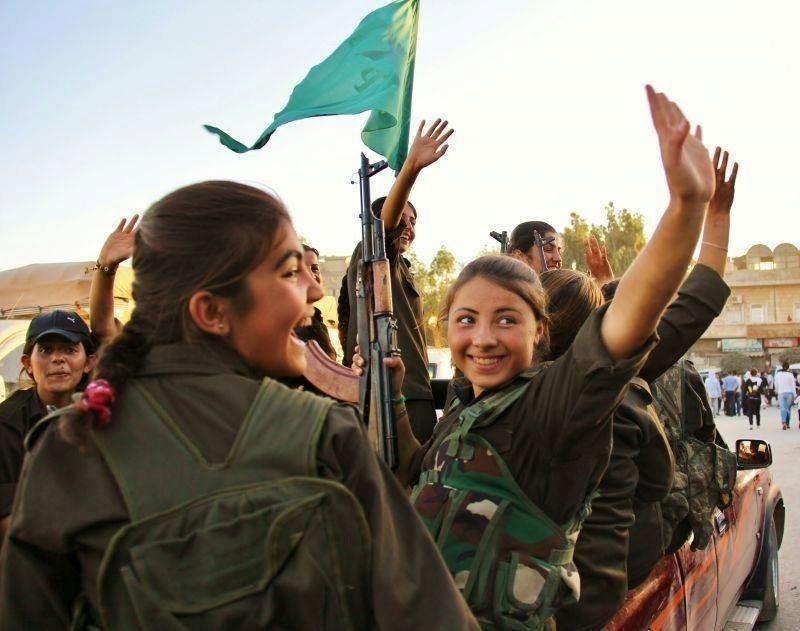 The recent Arab Spring briefly raised the possibility, but of course, where it might have made a real difference - in the Gulf states- the Emirs and their western allies rapidly crushed any chances of real change. What we do know for sure is that, whatever the prospects for the artificial islands, the World is sinking. Literally, the excess of the wealthy in Dubai and around the planet is threatening the existence of entire countries with sinking under the water - Lochahara island in the Bay of Bengal, once home to 10,000 distinctly un-wealthy people, disappeared forever in December 2006; and now whole nations such as the Maldives, Kiribati and Vanuatu face similar fates within just a few years. Our system is out of balance. Socially this is not news, but for the first time we are reaching a point of significant resource depletion and growing environmental exhaustion, neither of which can be resolved by clinging to a capitalist system that is founded on the concepts of inequality of outcomes and limitless resources. In such circumstances, the potential for violent conflict and disorder is legion, and a warning from the past resonates loudly around the tall towers of Dubai. Two and a half thousand years ago, Plato wrote: "Any city, however small, is in fact divided into two; one the city of the poor, the other of the rich. And these are at war with one another." Ratko Mladic has now been given a month to read up and prepare to respond to the charges against him, ranging from murder to genocide. As might have been expected, he fulminated against the legitimacy of the court and refused to comment on the charge sheet. 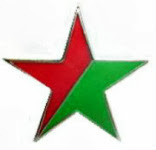 Instead, the former military commander of Bosnian Serb nationalists choose to glare and gesticulate obscenely in the direction of the bereaved relatives of just some of the tens of thousands of predominantly Muslim civilians slaughtered during the war of 1992 - 1995, when Serb rebels, armed by Serbia proper, tried to secede from the Bosnia-Hercegovinan state by force and "ethnic cleansing". With the passage of time, the West has nearly forgotten what happened - not that it did much to acknowledge the slaughter on the European Union's doorstep whilst it was going on. 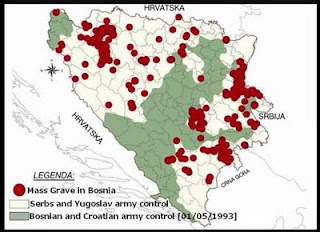 As blogged previously, Europe not only did nothing but, by means of an arms blockade against both sides, it ensured that the Serbs continued to have a massive inbuilt advantage, supplied as they were by the remnants of the Yugoslav Federal Army. Led by Britain, Europe repeatedly denied American pressure to intervene with UK Foreign Secretary Douglas Hurd and Britain's Balkans envoy Lord David Owen (who memorably and pompously told Sarajevans,"Don't, don't don't live under this dream that the West is going to come and solve this problem. Don't dream dreams.") both utterly adamant that Sarajevo should be abandoned to its fate. (Hurd was to go on to make a large quantity of money helping the Serb Government privatise its communications industry). At best the conflict was deemed simply too confusing for western Europeans to be bothered to follow or, at worst, the Bosnian Muslims, the largest group in Bosnia, were portrayed as eastern interlopers, ready to remake Saudi Arabia in the Balkan hills, when nothing could have been further from the truth. 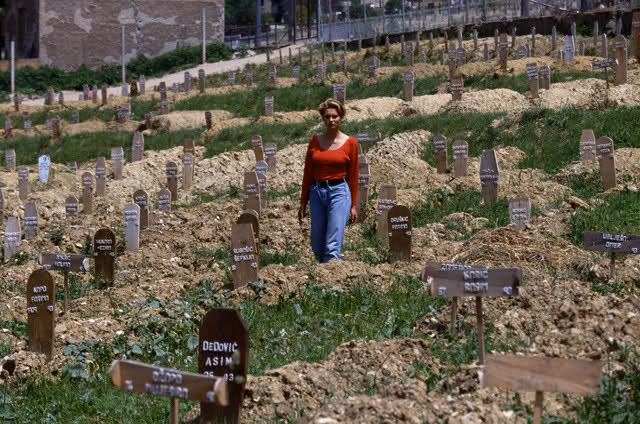 A few weeks ago, as Mladic was heading to the Hague, yet another mass grave was found in Bosnia. And yet again, the people in it were Muslims. And this is the thing: looking at the one hundred thousand people confirmed dead, the overwhelming majority were Muslim Bosniacs - especially among the civilian dead, where Muslims account for nearly 85% of deaths. And looking at a map of where mass graves have been found, they are exclusively in the territories that were under the Serb rebels' control through the war. It is hardly surprising then, that these crimes against humanity, which took place a short journey from the holiday beaches of north Italy, served to radicalise many of the younger western Muslims who ended up fighting and bombing for al-Qaeda. It does not excuse terrorism, but it certainly explains it. By contrast, in Bosnia itself, the Arab fighters who turned up to help the Muslims were treated with suspicion and in the main were eventually asked to leave. Although Saudi development money was sent to the country after the conflict (with mosques reportedly prioritised over any other reconstruction work in spite of the plight of local people), the Muslim Bosniacs were and remain far from the zealous fundamentalists they were portrayed as by both the Serbs and elements of the western media. 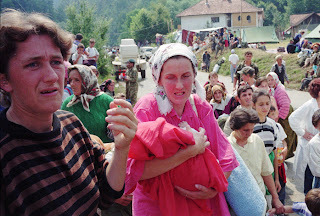 Not that it should have mattered, but, in truth, most defenders of Bosnia were casually religious until the attacks on them because of their faith inevitably sharpened their identity as Muslims. For centuries, they had lived alongside ethnically-identical Catholic, Orthodox and Jewish communities, gradually intermarrying. The Communist era saw many of all backgrounds turn to agnosticism and atheism. After hosting the 1984 Winter Olympics, Sarajevo became an international city, with, for example, none of the hallmarks in women's dress of Riyadh. 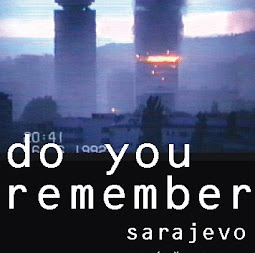 Even during the siege of the city by the Christian Serbs, a monstrous three-year long affair, its young people continued to hold rock concerts, film shows and beauty parades - the latter melancholically celebrated in the U2 song, "Miss Sarajevo", and which ended with the contestants poignantly parading a banner pleading to the World; "Don't let them kill us." Asked by CNN what she would do with her year as Miss Sarajevo, the winner, Inela Nogic, reflecting the reality of life in her city, replied, "I don't have any plans. I could be dead tomorrow." Our past defines us; how we got where we are and became who we are. As with all nations, Britain likes to choose the good bits - fighting Hitler, inventing penicillin and building the first railway. But as with all nations, we have acted questionably and wrongly many, many times. Avoiding these, ignoring the lessons or closing our eyes to our national culpability do nothing to help shape a safe and secure future. So as these shrivelled bodies are exhumed from their unmarked graves, their violent endings evident from the remains, don't turn away. Don't pretend it was nothing to do with us or that it is somehow all in the past. The xenophobia and racism that manifested itself in these hills and valleys exists still in every country in the world, ready to burst out like poisonous buds as soon as the conditions are right. If we close our eyes to the past, we end up blind to the future too. The surreal freak show that is the Con Dem Coalition continues apace. Talking to the GMB trade union, Lib Dem Business Secretary Vince Cable, warned the unions that any significant increase in strikes in opposition to Government public spending cuts could be met with legislation to restrict further the right to strike. Condescendingly, he suggested that the current level of disputes are ok and so he won't legislate - unless people start to use their right to strike. It is a twisted, deceitful logic that is being employed - you can have a right, as long as you don't use it. All the more insincerely patronising are his "this will hurt me more than it will hurt you" protestations, like some old headmaster admonishing the naughty boys. Who does this incompetent sell-out of a man think he is? The right to collective strike action has been a mainstay of workplace rights ever since the Liberal Party Government reversed the Taff Vale Judgement back in 1901. The judgement used common law to hold trade unions liable for any costs incurred or profits lost by employers as a result of a strike - effectively crushing any legitimate right to strike. Following massive campaigning by unions and by Labour and Liberal politicians, the Liberal Government elected by a landslide in 1906 reversed the decision through the Trades Disputes Act, which removed trade union liability. This concept, of a right to strike without liability, has underpinned even the Thatcherite legislation of the 1980s. 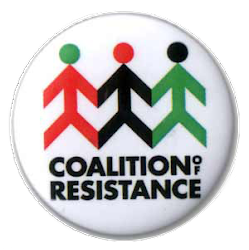 Its latest manifestation is in the Trade Union & Labour Relations Act passed by the Conservatives in 1992. British employment law is at its heart still governed by common law nostrums on the law of contract and, within that, the enacted laws of Master and Servant which were introduced in the 18th century and which require "obedience and loyalty" of employees towards their contracted employer. 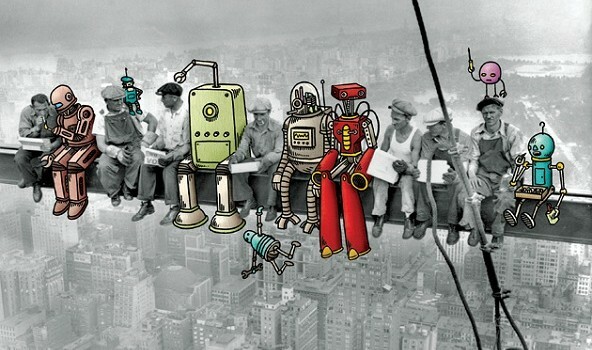 Later statute laws on employment conditions have modified but not replaced this inherently inegalitarian concept, which is also at the centre of the capitalist economic system. Given that employers, particularly now in the form of large, financially powerful and impersonal corporations, hold the whip hand in this relationship, being effectively in control of the livelihoods and career prospects of their staff, the right to collective action by employees via their trade unions is utterly essential to provide any sort of counterbalance. The great object ...was, and still is, to place the two rival powers of capital and labour on an equality so that the fight between them, so far as fight is necessary, should be at least a fair one. ﻿The unions are central to the defence of needlessly beleaguered public services - and popular in doing so. Polls repeatedly show that the public have much greater faith in the trade unions now than for decades and infinitely higher trust in them than in our political leaders and the corrupt business class whose interests our government so keenly serves. Strikes will come as the cuts bite, as services are withdrawn and people suffer - and if Cable's response is to try to remove the right to strike in order to suppress opposition, he and his ilk will be inviting strife probably unknown in this country for nearly two centuries. Dangerfield wrote of the passage of the Trades Disputes Act as a seminal moment in The Strange Death of Liberal England, his analysis of the collapse of the once dominant British Liberal Party. A century on, by in effect seeking to repeal the principles it established, Cable looks firmly resolved to kill his party all over again. And no one will miss it. And now for something TRULY awful: Lib Dem sycophancy at it's very worst. Labels: "Con Dem", "employment protection", "trade unions", "Vince Cable"
The last twenty four hours have seen Britain's social care system plunged into genuine crisis on several fronts. Most graphic has been the secretly filmed abuse of residents with learning difficulties at a hospital facility in Bristol. An undercover journalist spent five weeks posing as a member of staff to record images of residents being doused with water for not obeying instructions, beaten, stamped on and verbally abused by the people responsible for their care and well being. Next came the news that Southern Cross, the country's biggest care provider and landlord to over 31,000 elderly people with care needs, is in deep financial trouble. It has staved off bankruptcy by securing temporary rent reductions from its own landlords, but only until October. And finally, but by no means least, a group of senior clinicians wrote to the Guardian condemning the Con Dem Coalition Government's heartless pursuit of hundreds of thousands of people with mental health problems on Incapacity Benefit and Disability Living Allowance. Since their election a year ago, the Government has massively revamped the already widely criticised tests for disability brought into operation for new claimants only in 2008. 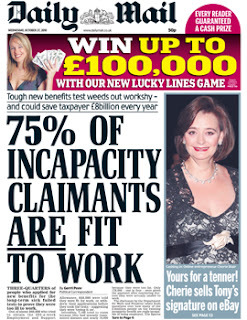 In addition, it announced that all claimants are to be reviewed, eventually every six months, in what amounts to a blatant attempt to hound some pretty vulnerable people off benefits into an uncertain future where jobs are relatively thin on the ground and where many employers are clearly deeply prejudiced against disabled people to begin with. The result, the clinicians warn in their letter, has been to increase the stress and mental health problems of the people targetted, with growing evidence of both attempted and actual suicides by deeply distressed people facing the loss of the pretty tenuous safety net that has been in place until now. But what if they can't work? ATOS Origin, a large French-based IT and facilities group, has been engaged to carry out the review, which will cover some 1.5 million people. Buttressed by pronouncements by Conservative Ministers that at least 20% of people on disability benefits should be in work (a rather arbitrary figure with no research to support the assertion), ATOS to date fail or cut payments to over 90% of people who go through what should be a comprehensive assessment lasting an hour or longer. Many claimants emerge with tales of 10 minute gallop-throughs, with surreal lines of questioning including imagining how people with walking difficulties might cope better in a wheelchair; or how a blind person with a guide dog has consequently no disability. Terminally ill people have been ordered back to work - though perhaps the most bizarre incident was where a woman dismissed by her employer as permanently unfit for work after an assessment by an ATOS occupational health therapist was sent for a IB review with ATOS, who decided there was nothing wrong with her. On appeal up to 2/3s of people have their benefits reinstated, but only after some months and after a deeply worrying time for them. And many are then called back almost immediately for a new assessment - harassment in all but name. With the drip-drip of Government propaganda increasingly portraying disabled people as a burden on society, the last year has seen a rise in aggression and violence towards disabled people according to a survey by Scope, and terms of abuse such as "spastic" and "mentalist" are creeping more and more into the acceptable lexicography of the mass media. So-called comedians such as Frankie Boyle are feted and awarded TV shows in spite of "jokes" about disabled babies. Disability has long been an awkward issue for society. I have worked with organisations providing disability support for the last 21 years and can only put this down to ignorance at one end of the spectrum and real, genuine evil at the other. The media is frothing spectacularly at the abuse filmed in Bristol, but this is the same media that routinely denounced those with mental health and other less physically evident disabilities as scroungers, malingerers and frauds. The Con Dems play up to this with stunts like the list of excuses put forward by people found to be defrauding disability benefits earlier this week - implying that fraud is widespread when in truth every audit carry out confirms the level as around 1% of total spend, costing the exchequer some £2 billion p.a. - not insignificant and not to be ignored, certainly, but where is the same pursuit of tax avoidance which robs the nation of at least £20 billions p.a. in lost revenue? Of course, the elephant in the room with all three of the crises brought to the public's fleeting attention is that the profit motive features in all of them: the Bristol hospital is run by a private contractor, Castleback Care. Southern Cross, meantime, is a large business, complete with its Investor Centre (click here). which has happily ratched up five figure profits in the not-distant past (and its former Chief Executive was personally £13 millions richer when he left them after heading up a tendfold their expansion in Southern Cross' operations). Meantime, ATOS Origin stand to make over £300 million from their efforts to stamp down on disabled people, with unconfirmed rumours that additional bonuses (or perhaps bounties would be a more appropriate word) payable for each person knocked off the incapacity benefit or DLA registers. Prime Minister David Cameron claimed that the disability of his late son, Ivan, had opened his eyes to the prejudices and barriers facing people with disabilities. Poor little Ivan is sadly gone now, but his father's awareness appears to have passed away with him - referring to disability benefits as a "something for nothing" culture and slashing hundreds of millions from local authorities social care budgets, leading to the closure of day centres and the isolation of thousands of disabled people, unable to leave their homes or access any sort of beneficial social interaction. And yet, perhaps unsurprisingly, he seems content with arrangements that pour good money after bad into the pockets of companies that seek to make a profit out of welfare, creaming off cash from compassion.